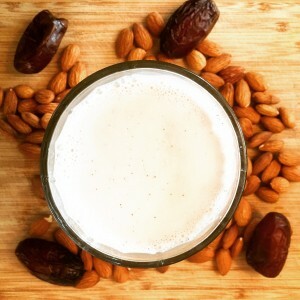 Home » Healthy Drinks » Homemade almond milk….there’s no going back! Homemade almond milk….there’s no going back! It took us a while, but we’ve finally starting making our own homemade almond milk…and it’s true, there’s no going back. It is soooo good and fairly easy to make. Store bought almond milk just no longer has a place in our refrigerator. You can find tons of great recipes on line, most of them are pretty similar. Here’s how we make it: (You’ll need a nut milk bag…no, that’s not a joke:) A fine mesh strainer will work as well. Use in your favorite smoothies, with your soaked oats or drink on its own. It’s pretty divine, hope you enjoy. btw…you can either discard almond pulp (wasteful) or to fully utilize…dehydrate and turn into almond flour for your other recipes.